When I made pizzelles for the first time last Christmas, Michael immediately suggested I come up with a chocolate version. We really liked the krumkake recipe we tried from Gourmet this year, so I decided to base my chocolate pizzelles on that recipe. The orange zest is optional and adds a nice hint of citrus with the chocolate. 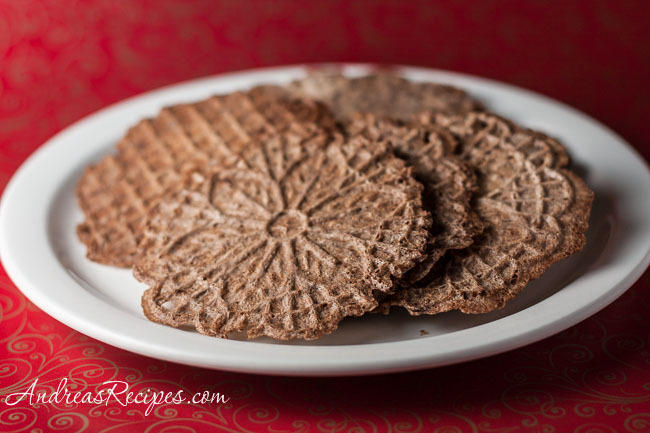 The cookies are easy to make but do require a pizzelle maker. They can be served flat or rolled into a cone or tube shape, and both the rolled shapes just beg to be filled with some kind of cream or marscapone filling. Michael was delighted to come home and find these all ready for him to sample, and Top Gun couldn’t keep his fingers away. 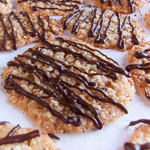 We think these crispy chocolate cookies are addictive. I missed the deadline, but Susan of Food Blogga is celebrating her Christmas Cookies event. 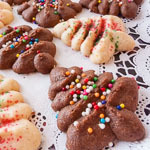 Susan has a big round-up of favorite Christmas cookies from around the world, so be sure to check it out. Warm the pizzelle maker while you mix the ingredients. In the bowl of the stand mixer (or bowl with hand mixer) beat the eggs and sugar together until the mixture is light. Add the cold water, cooled butter, and vanilla. Whisk together the flour and cocoa powder, making sure there are no lumps, then add to the wet mixture. Mix on low until the batter is smooth and the chocolate color is even throughout. Pour 1 tablespoon of the batter for each cookie onto the heated pizzelle maker and close the top. Cook according to the manufacturer’s directions, usually 30-60 seconds. Gently lift with a fork or silicone spatula and transfer to a wire rack. Store in a tin, not airtight, away from other cookies. They need some exposure to air to stay crispy. The texture is thicker than the original krumkake recipe I used to create these cookies. If you prefer a really think, crispy cookies, use just 1 cup of flour. The first time I had an ice cream sandwich made with pizzelles I fell in love, and though I’ve never made pizzelles, I’d love to try. <3 pizzelle! 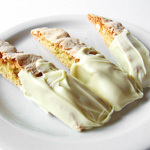 In my family we use them to make cannoli — I wrote it up a couple years ago. Guess it’s time to redo it; that’s back when I was using puny images. I would definitely keep the addition of the orange zest; chocolate and orange are just so beautiful together. Hope your holiday was wonderful, Andrea! Wooow they loooooooook so tasty I wanna have some so badly, I just want to know where do you get this sugar you mentioned? and what you mean by cold water? like any tap water or what? Thanks everyone! Mark, granulated is sugar is the regular white sugar you find in the grocery store, and yes the cold water can be tap water. Hi Rieka. I based these chocolate pizzelles on a vanilla krumkake recipe originally from Gourmet magazine. This recipe looks great. I think I will make these this week to use up a ton of leftover prune lekvar I have from another recipe I made this weekend. I think that the prune butter would be delicious in a chocolate pizzelle sandwich. Andrea and anyone wanting to use this recipe, please note correction on flour. It should say 1-3/4 cups. This should prevent any disappointment from the misprint. Enjoy your holiday baking!!! Andrea your receipt calls for 1 3/4 CUP FLOUR and for thinner use 1 cup flour, wouldn’t that make them thicker.